One of our goals when working on Lucy’s bedroom redesign was to make it feel different from before, even drastically so. She was ready for this change. But most of all, we wanted her to feel relaxed and comfortable in her room. We wanted the look to be feminine and grown up and serene. 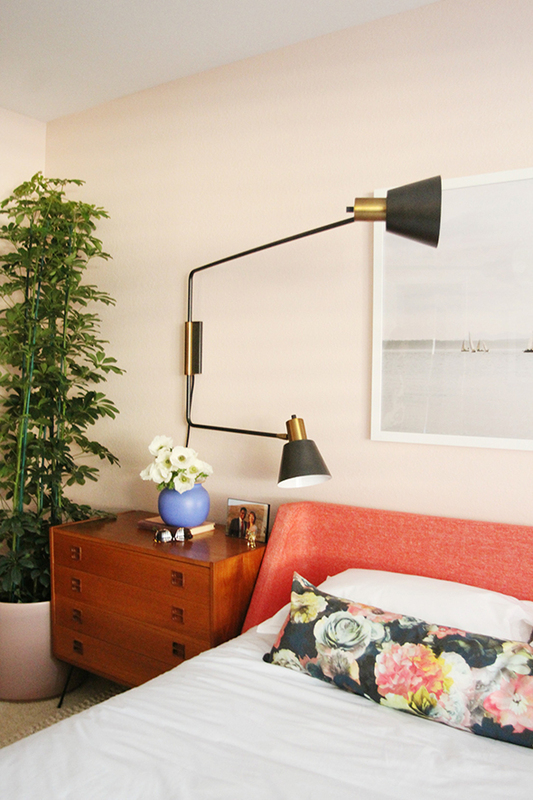 Joanna originally suggested the blush color (a color we both love for bedroom walls!) and Lucy was totally on board. We chose Benjamin Moore’s Love and Happiness in an eggshell finish. I love the coral-y blush color! It’s not too intense – it just feels soft and cozy! 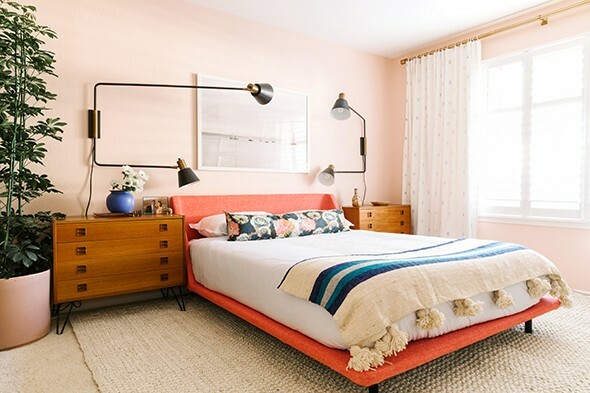 We knew most of the linens and textiles in the room would be white or neutral, so we thought the bed could be a really fun pop of color in here. 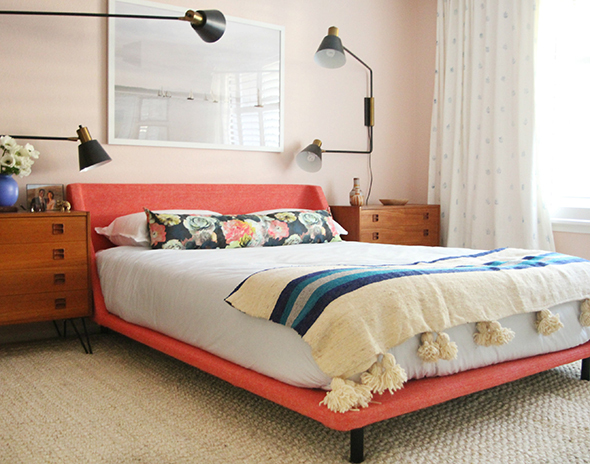 We chose Blu Dot’s Nook bed in Poppy, which is a bright pinky-red in person. The quality of that bed is TOP NOTCH. I’d love to get one for myself in the blue color. Once we had the bed picked out, we looked around locally for nightstands to bring to California with us. 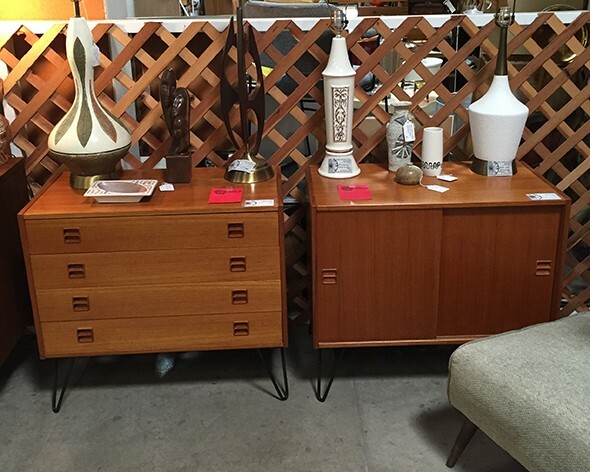 We found these Danish beauties at Mathematica Modern at Zinneas (the same vendor who sold us the secretary weeks before) and we asked him if he had a mate to the version with the drawers. He did! And we LOVE them! They’re petite, but I love all the drawer storage. 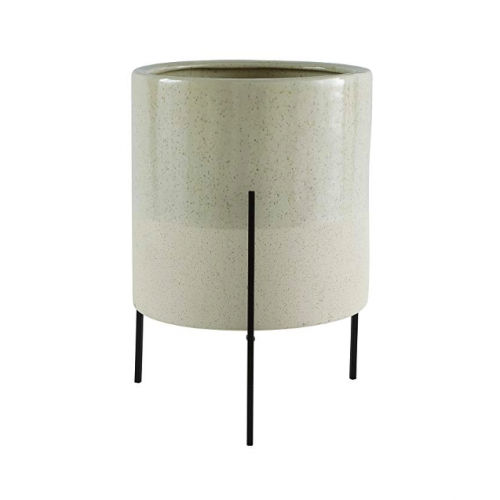 And the hairpin legs the seller added makes the height of the drawers a little easier to access. Somehow Mathematica always has a pair or two of these in their booth, so if you’re looking for something similar, it’s worth a call to Zinnea’s or an Instagram stalking session. 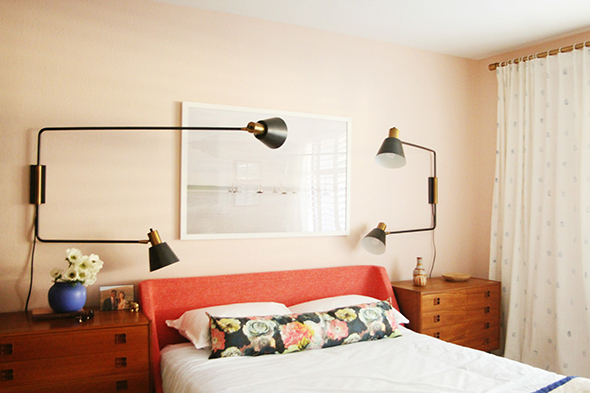 We wanted statement-making sconces that would help to brighten up Lucy’s room (remember, there was essentially no overhead lighting anywhere in the apartment) and I think these steel and brass sconces from Rejuvenation totally fit the bill! I love the masculine/industrial element they bring to the space. We wanted the art on Lucy’s walls to be on the softer side too. 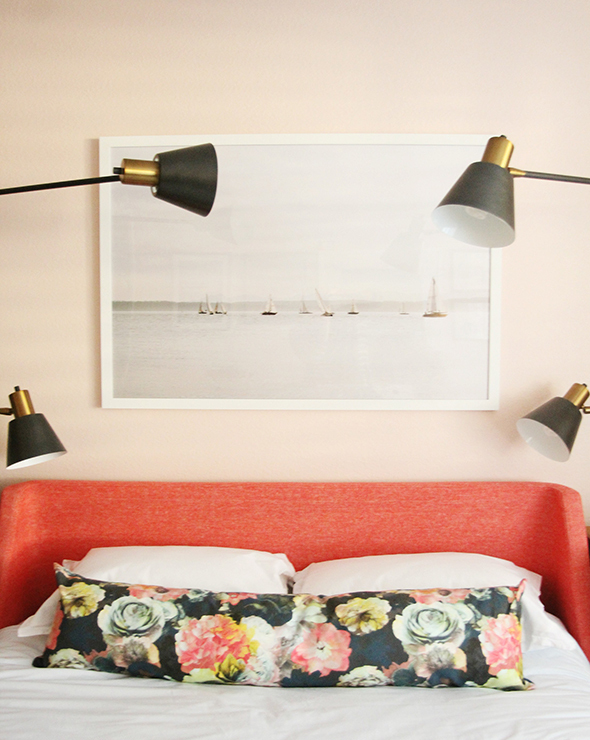 We found this sailboat photo print from Eventide Collective that we all loved and felt like was such a peaceful image. The extra dose of white/soft colors is lovely in here, I think. The bleached jut rug was a steal from World Market and the color was perfect for layering on Lucy’s carpet. 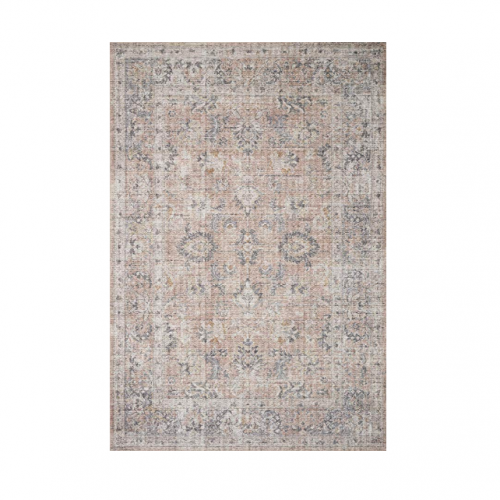 I love the sophisticated texture of a natural woven rug! We chose super simple bedding from Parachute Home in the softest ice blue. It is SO lovely in person and super high-quality. 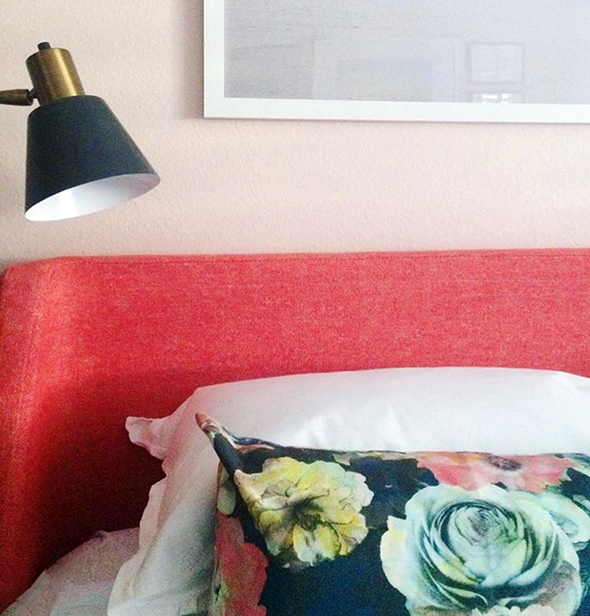 I love, love, love how it pairs with the floral lumbar pillow we had custom made from Stuck on Hue. I bought the Moroccan pom-pom throw from Etsy. The block-printed curtain panels are a DIY (tutorial post coming up!) 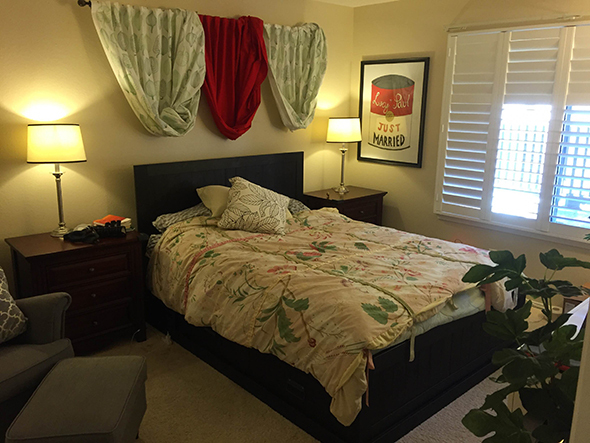 using IKEA’s Ritva curtain line – the very best curtains at IKEA! 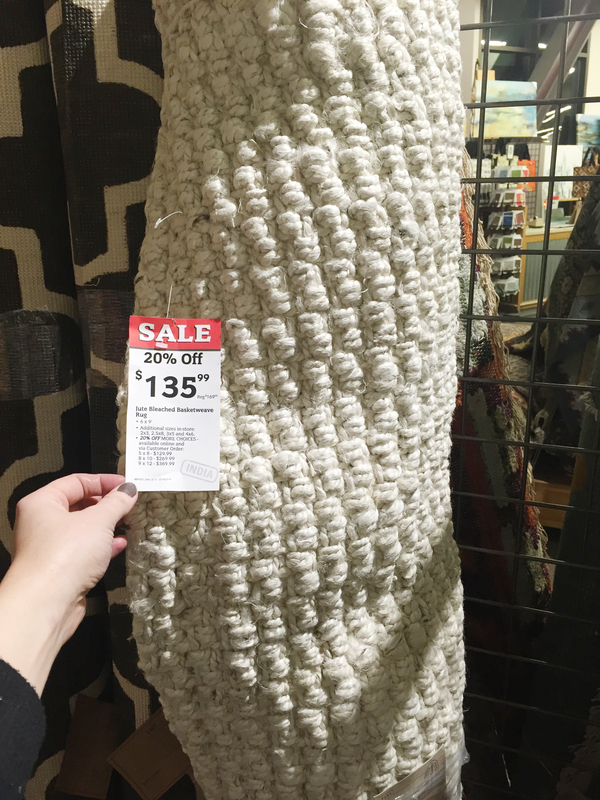 The price can’t be beat for the size of the panels, and the white color is bright and pretty and has a nice linen-look texture. I also really love that they come lined and with a drapery hook tape already sewn in the back! IKEA sells these three-prong hooks that slide right into pockets of the drapery tape and easily make a three-finger pleat that is ready to hang right on drapery hooks. Our curtain hardware is from West Elm. I love the touch of warmth from the brass in that rod! Professional photos by Julia Robbs for Cup of Jo. 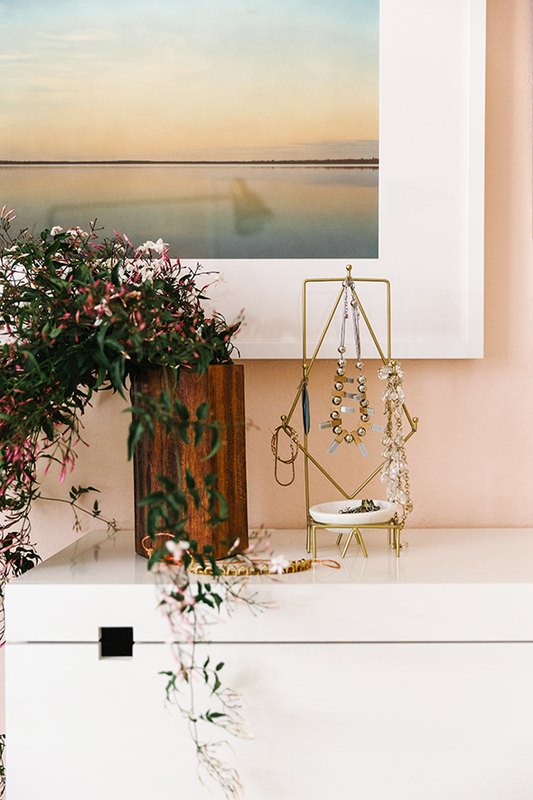 Floral and Styling assistance by Kendra Smoot. Additional photos by Jenny Komenda, Kate Lines and Kayla Taylor. I’ve enjoyed your room breakdown posts. I’m a details gal, so reading the “whys” behind design decisions gets me going more than just the pretty photos alone. Once again, I’m so pleased to be part of this special makeover. Even from the other side of a computer screen, each room looks so much happier and full of possibilities now. Kudos to you and your team! P.S. I pained my work studio a soft pink in the fall and I’m still looking for the right dash of black. I don’t think laptops, a printer, and a TV count! Beautiful room! 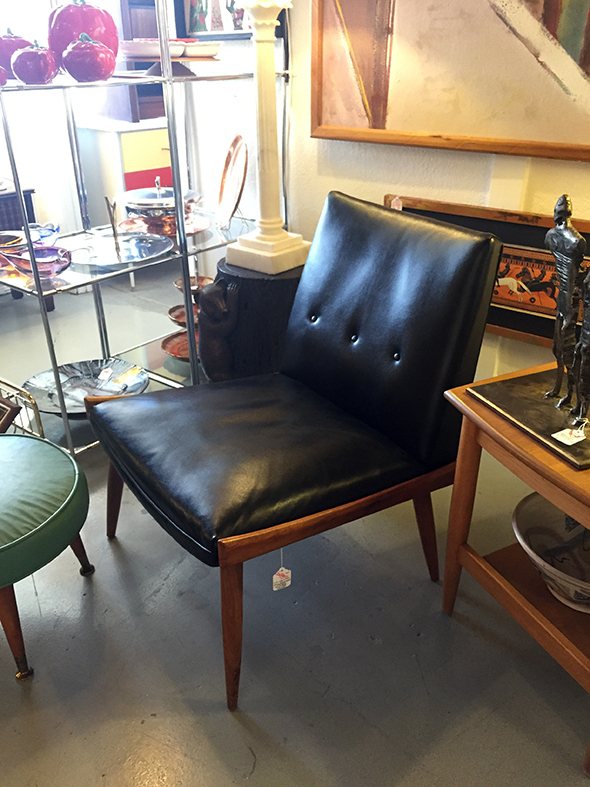 I would love to know where that cute blue pillow on the black slipper chair is from. Coi link non mi era mai successa una cosa del genere.Se faccio click destro, copia indirizzo, incollo nella barra degli indirizzi, tutto ok.Se clicco direttamente, vengo mandato sempre sulla pagina del raofFatore.nireipx su linux. Beautiful job! It is so cozy, and I’m surprised by how much I love that paint color. 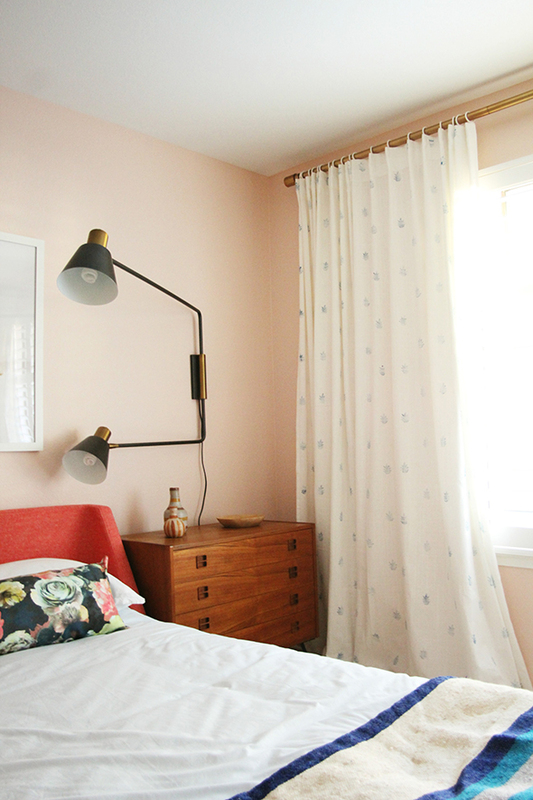 We have the ritva curtains in every room in our house (besides the kitchen) and love them. They are made of such beautiful fabric that hangs so well, and you can’t buy yardage for what they go for! This is so pretty! 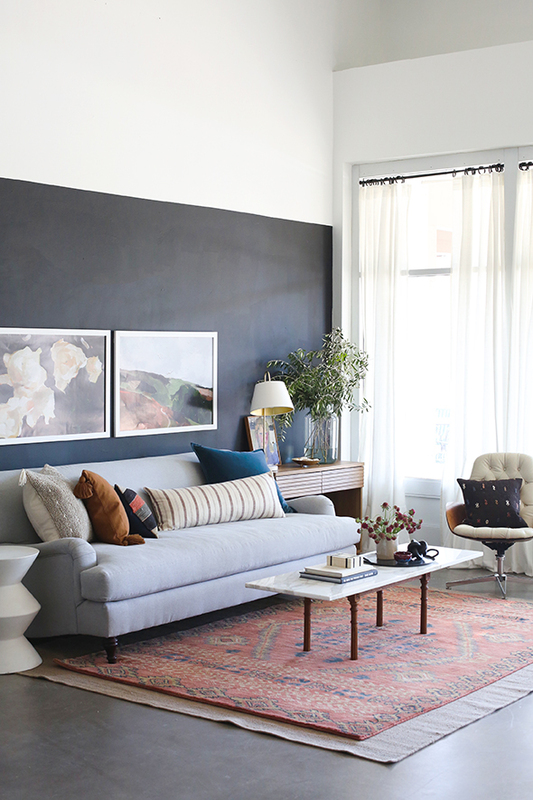 The art definitely makes the space and sets a very restful tone. 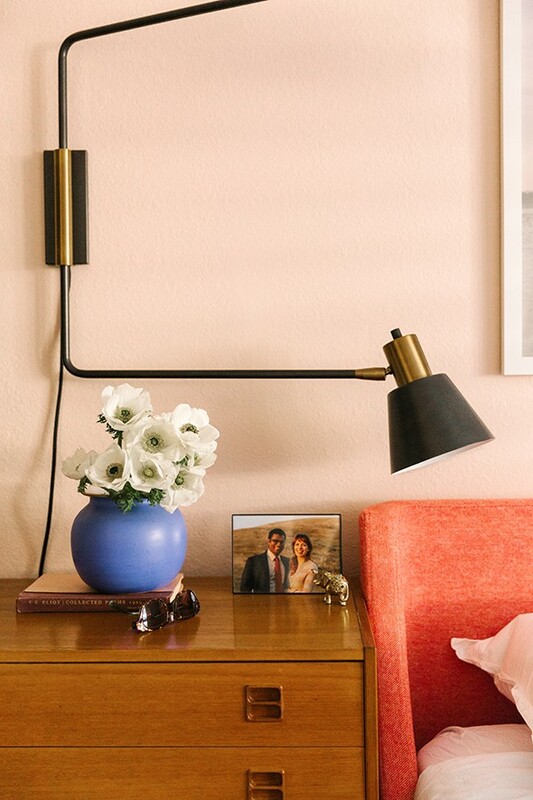 The pink is also totally my kind of color choices – so pretty and bright! 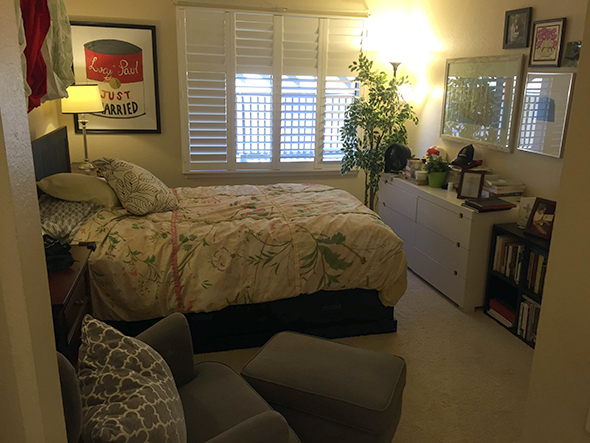 I’m happy that there was a huge change in the bedroom but the light remind me of a movie set. Light, camera action! I know I’d wake up thinking someone was standing over me. 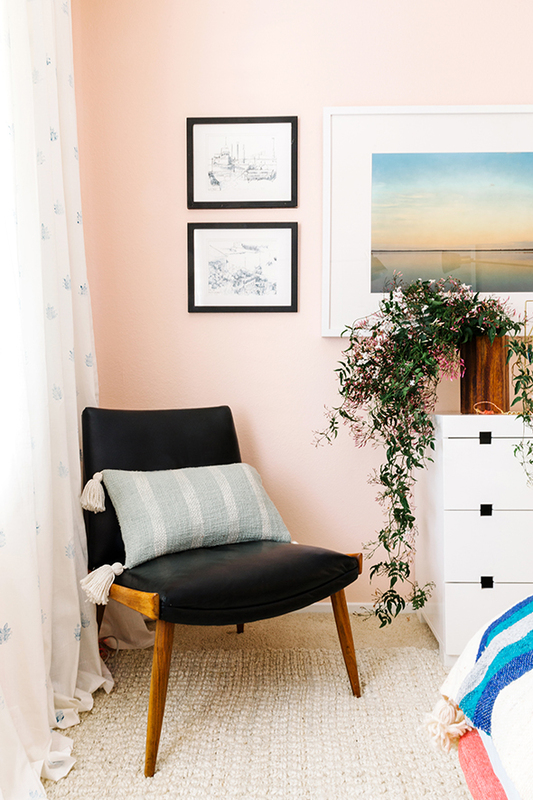 I painted my own bedroom a similar blush-pink color this past summer. I love it; it’s very soothing. Our Room & Board grey bed with “wings” looks good in our room, but I think I like the Blu Dot a little better. I’m looking at your other choices for accent ideas. It’s a beautiful room! I’m intrigued about creating pleats with the hooks mentioned and the Ritva curtains, but couldn’t quite follow how to assemble them. Does anyone know? Also, would the Ritva curtains work the blackout panels that Ikea sells? I have a bay window in the room that will become a nursery when I have my first this summer, and I’ve been advised that blackout curtains are an absolute must. Right now I have pale grey linen Aina curtains, but they are just decorative and don’t cover the full expanse of the windows. 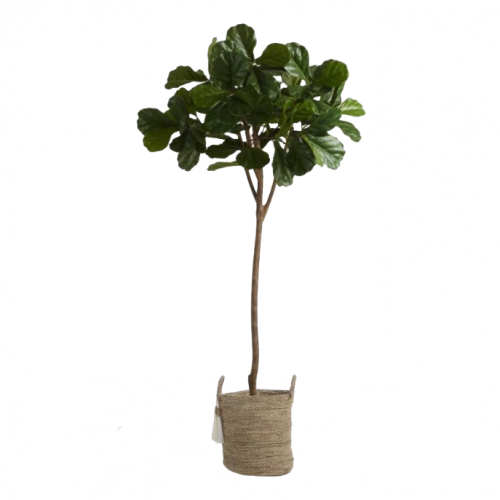 I could buy additional panels and line all of them with blackouts or switch to the Ritva, which I would prefer, since they come in a longer length and I think white would work better with the ultimate decor. If anyone has recommendations around lining with blackout liner or how to achieve the pleat Jenny mentioned, I’d love the advice! Thanks! Hi Sara! 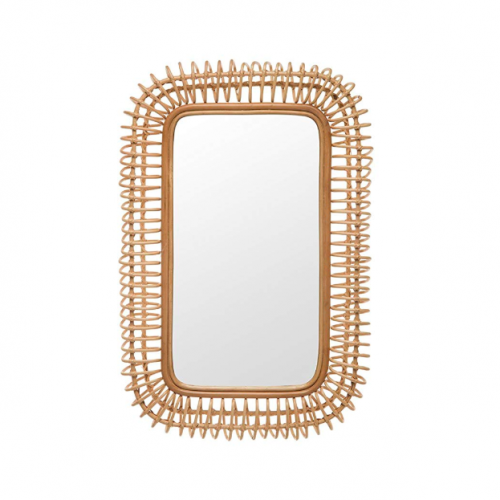 I used the Ritva panels in my daughter’s nursery a couple of years ago. I considered trying to do some type of lining using the blackout curtains from Ikea, but they only sold them in gray (not sure if that’s changed since), and I was afraid the color would show through the white Ritva panels. I ended up ordering blackout fabric from Amazon (I think the seller was actually Fabric.com, but the yardage was cheaper on Amazon – less than $10 I think), and I had a friend sew the blackout fabric on the back like a liner. It gives the curtains a really nice weight, and completely blocks out the light. I love everything you did in Lucy’s home! 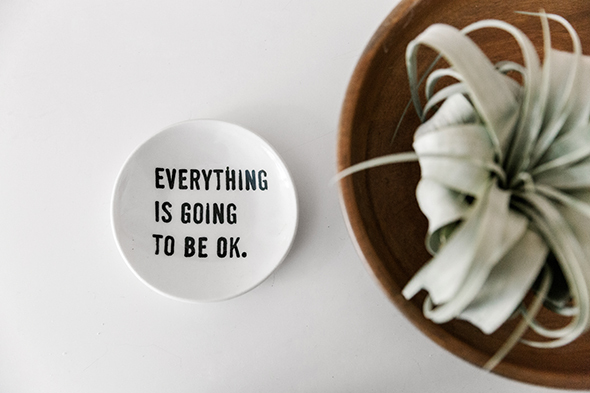 Joanna’s post on Cup of Jo was great, but I am enjoying your room-by-room posts and hearing your perspective. 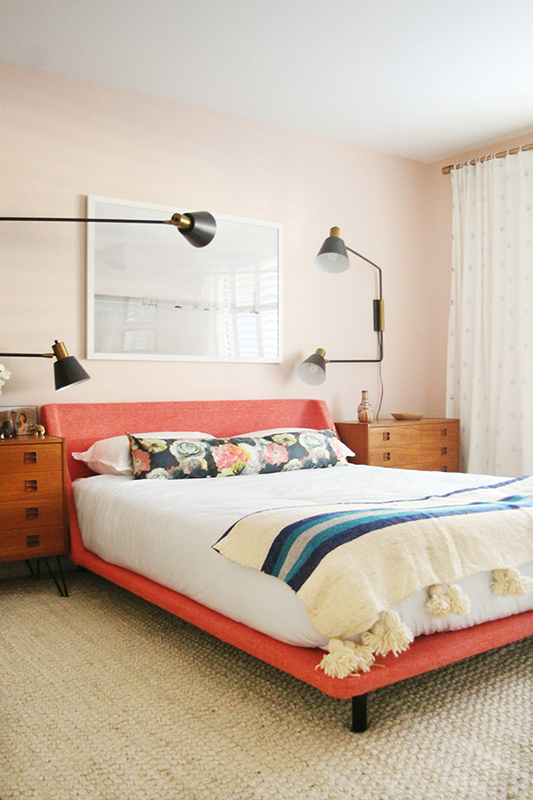 This bedroom is stunning – that blush color is so soothing. It’s all so fresh! I’m so happy for Lucy. You’re precious to have helped her sister with this makeover. This is my favorite room OF ALL TIME! I follow a lot of blogs and have never seen a room that touched me so deeply. Thank you for all you do, especially for this jelly woman and for brining us readers along. Love everything you did in home. This is so pretty! Beautiful job. Love this room. Hi Jenny! 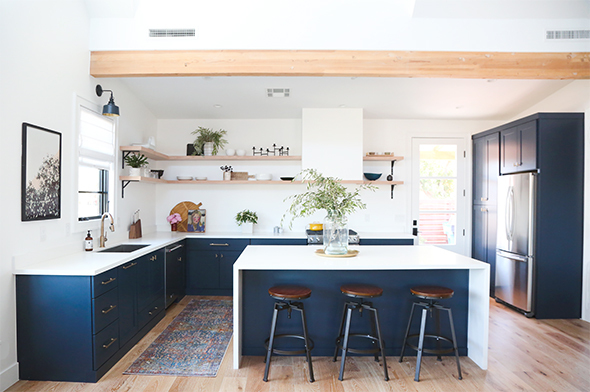 I love, love, love this room and the rest of the house makeover you did for Lucy, it’s beautiful! One question I always have on projects like this (I’m assuming there are other rooms that didn’t get updated) is how do you get the new rooms to flow with the rest of the house? This is such a dramatic transformation that I wonder if it feels funny walking into rooms that didn’t get updated – does that make sense? I wish I could afford you! You are so insanely gifted it isn’t even fair! I love what you have done here Jenny. I’m a long time reader and a huge fan!! You and your team are so talented! Please bring your blogroll back. I would go to your blog everyday for that. 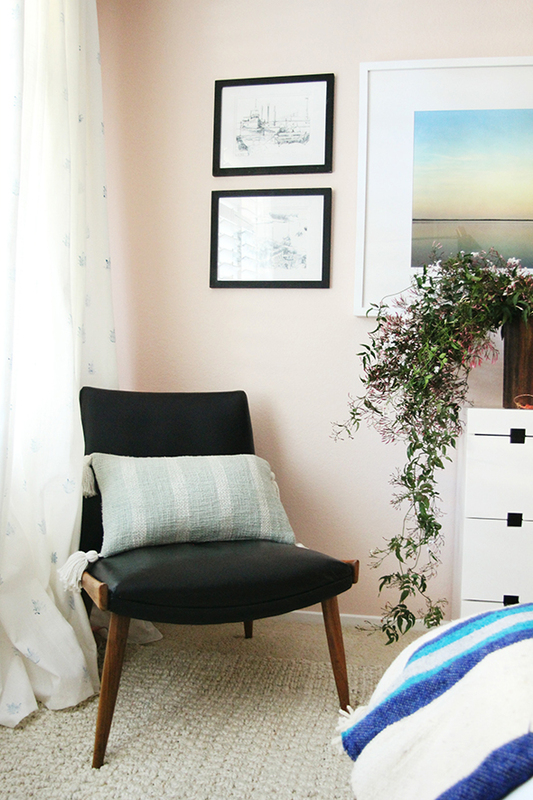 Love this room (and the whole makeover) so much! Would love to know where you found this amazing planter!! ?